Isabella Stewart Gardner and the museum that she created provide inspiration to many -especially to women and girls who recognize a bit of themselves in the founder’s story. Every April, the museum issues a call to all “Isabellas” to gather at the museum in celebration of the many ways in which Isabella Gardner and her museum continue to inspire each of us. This year, join us to take part in art-making and looking activities throughout the museum. Plus you'll get to see the beautiful hanging nasturtiums - another annual April tradition! The museum is accessible via public transportation on the #39 Bus or the 'Museum of Fine Arts' stop on the Green Line 'E' Train. For driving directions, visit www.gardnermuseum.org. 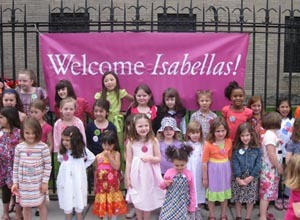 Register yourself or your Isabella by at filling out our online sign-up form. You'll receive an Isabellas Free...Forever membership card & welcome packet!